causing Selisa to shiver as she and a dozen other newly arrived treasure hunters stood before the Huldra. The witch's firm eyes glared at them from behind her mask, assessing them one by one. "What's going on?" Galar whispered. "We haven't done any-"
Selisa silenced her fellow explorer with a discreet kick to his shin. This was hardly the time for arguing. One barely dared to even breathe. The feeling of uneasiness grew stronger as the Arch Witch's gaze fell on Galar, and darkened. "You..." The voice was hateful and as accusatory as the bony finger that pointed to Selisa's friend. "You are the prey." The witch turned to the wrathguard accompanying her, whose hands rested easily on the handle of his axe. "Take him away. And his companions too,"
Before Selisa or Galar had time to react, before the wrathguard had taken so much as a step towards them, the clear clang of a lonely bell cut through the air. The witch flinched, then glanced at the tower balancing on the edge of the plateau, ten steps sway. "Too late", she hissed, turning to hose gathered before her. Now plunderers, fight or die! The darkness you have awoken is upon us!" Karvosti: The Witch Hammer invites you to join the treasure hunt of a lifetime! 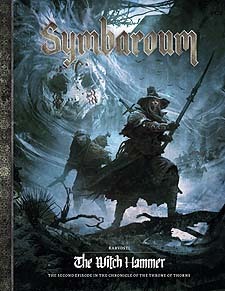 Between these covers you will find not only the epic and action-packed adventure The Witch Hammer, but also nearly a hundred pages of campaign material describing the cliff of Karvosti and its surrounding areas, including an extensive section with new rules and guidelines pertinent to the setting and adventure. The With Hammer - the most dire and perilous treasure hunt since the days of Symbaroum. An extended account of the Krvosti region, to be read by both players and Game Masters. Twenty unique establishments where player characters may rest, eat, drink, gather information or seek an audience with local dignitaries. A comprehensive chapter for the Game Master, describing what lurks beneath the region's surface, with plenty of plot hooks to develop into adventures or entire campaigns.